Great reminder of the humanity and personhood of the unborn! A couple of bumper stickers with similar messages can be placed on poster board for a great backdrop to your display. THESE ARE SMALLER BUMPER STICKERS AND FIT NICELY ON THE BACK OF THE CAR. I ALSO PUT THESE ON THE FRONT CAR DOORS and ALWAYS BUY ROLLS OF MAGNETIC STRIPS SO I DON'T GUM UP MY CAR. We ran out of this bumper sticker last year and had requests to reorder it. I guess that speaks for itself! Nice color and quality--great message too! I have owned and use this particular statement whenever I have the opportunity to speak out and share about the pro-life movement! 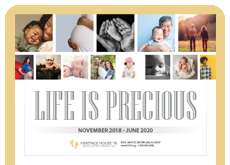 Being the couple coordinators in our Couples for Christ-Gift of Life ministry in our chapter, this is truly an encouragement for us to stand up for the sake of the unborn! I love this bumper sticker because it shows the beauty of the baby, with my belief. I previously had the sticker "A person is a person, no matter how small" in the cartoon format, I think this real photo is so much more effective. I love the clarity of the message. This bumper sticker is so effective because it shows what an actual baby looks like in the womb. It is not just a glob of tissue! This really makes people think about the personhood of the unborn children and their worthiness of life!